This Labor Day, I stand with working women, who are fighting for the most basic right of all, the right to have a life and make a living. I do not have a job. I haven’t had one in years. But, as mom of three little ones, I feel like I am working harder than I ever have before. Today, I woke up before the sun came up, nursed Madeline, enduring her karate chops to my bladder for almost an hour. Then, I got three kids ready for the day, winning (just barely) a major fight with Seamus about how it’s too hot to wear sweatpants, and engaging in high-level negotiations with Rosena about an outfit that would cover (but not itch) the bug bites on her legs. Then we ate breakfast, and I cleaned the dishes before getting the laundry started. Finally, I hitched up the bike trailer and rode Seamus and Madeline to pre-school about three miles away. It was difficult, terrifying, fun and totally unnecessary because the bus stops in front of our house, but Seamus loves it. All that was before 9 a.m. And it’s hard work for sure, but I know I’m lucky. I did it all in a nice home, in a safe community, for kids who are healthy, and alongside a husband who is working just as hard as I am. I am also lucky because I have loved almost all my jobs: In my decades of paid work, I have felt valued, stimulated and challenged in flexible, humane, collegial environments, where I was respected and relatively well paid. Not your everyday American work experience. In fact, I disliked only one job in my whole career. For my first work study job in college, I cleaned the second floor of the Hampshire College library (including bathrooms that were always filthy but never busy). But even that job was fun in a behind-the-scenes kind of way, in that I got to know and care about the janitorial staff. I saw and respected work that is too often invisible if done well. That sounds amazing, but today, it seems like Labor Day is more about shopping than relaxing, which means that lots of workers are working this weekend and they are not carving grandeur from rude nature. I’m talking about people like the workers at Walmart, where shoppers are being offered deep discounts on a huge array of products and workers are fighting for a living wage. Fierce battles, courageous work and old school organizing by Walmart workers and supporters have resulted in a win. The country’s largest private employer company announced in February that it will raise its starting wages to $9 and then $10 an hour. This is great, but Americans for Tax Fairness found that even with these increases, Walmart will continue to benefit from billions in federal subsidies. Workers being paid $10 an hour for Walmart’s 34-hour work week bring home $17,680, qualifying them for food stamps, Section 8 housing, school lunch program, Medicaid and other public support programs. Basically people are working full time, but not making a living. Then there are workers like Adriana Alvarez from Chicago. 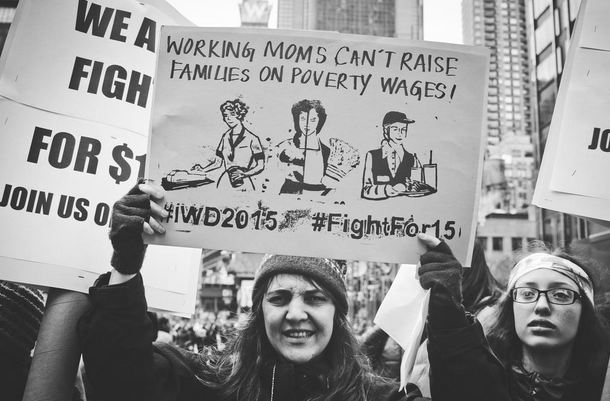 She writes, “I’ve worked at McDonald’s for five years, but still make only $10.50 an hour. The only way my son and I can make it is with food stamps, Medicaid and a childcare subsidy. Most of my coworkers are in the same boat, no matter how long they’ve held their jobs.” Alvarez and her three-year-old son Manny live in a basement apartment that leaks when it rains. She is a national organizer with the Fight for 15 movement. She says that when they win $15 an hour, the first thing she’ll do is “move to a decent place to live and be in a neighborhood with good schools.” Alvarez isn’t alone; the $15 an hour living wage movement is gaining traction, but there is a long way to go before I can in good conscience consume their buttermilk crispy chicken sandwich. One of the great things about not having a job is that I didn’t have to leave my little ones and go back to work when they were small. I knew I was in a privileged position, but I didn’t know how good I had it until I read Sharon Lerner’s groundbreaking (as well as heartbreaking and rage inducing) study for In These Times. Lerner, who also wrote “The War on Moms: On Life in a Family-Unfriendly Nation,” looks at Department of Labor and Census data to try and figure out how much (if any) time women take off when they give birth. Only 13 percent of full-time workers in the United States had access to paid family leave in 2012, according to the Bureau of Labor Statistics, so everyone else has to cobble something together. Here is what she found, looking at DOL data on women who took time off to care for newborns in the last year: “Nearly 12 percent of those women took off only a week or less. Another 11 percent took between one and two weeks off. That means that about 23 percent — nearly one in four — of the women interviewed were back at work within two weeks of having a child.” Two weeks! It took me almost a week to walk down the stairs and two weeks to fix myself a sandwich. Lerner talked with women at many points along the economic spectrum. Low-income women without access to paid leave spoke of being afraid of losing their (multiple) jobs if they stayed home to care for newborns. Raven Osbourne, a single mother in Mississippi, went back to waitressing at IHOP a week after her son was born and added overnight shifts at a gas station when he was a month old. She was also going to school full time. IHOP would have given her unpaid time off, but she couldn’t afford to not earn a wage. Professional, middle-class women who worked for companies (and nonprofits) that promise decent benefits packages spoke of being afraid of taking advantage of leave packages because they might lose out on promotions. The White House is working on an executive order on paid sick leave for federal contractors (but we just need to look at Guantanamo to see how President Obama’s executive orders are faring). The Democratic contenders for the White House in 2016 are campaigning on paid family leave. The Democrats and Republicans in Congress are talking about the issue and trading proposals. In the meantime, women are trying to plan their pregnancies around their employer’s leave policies, pumping breast milk in their cars before their shifts at the factory, getting home just in time to tuck their kids in before they go to sleep, patching together multiple jobs while their infant is in the neonatal intensive-care unit, and working through crushing depression, acute physical pain and almost physical longing for their small children. Is this what I am missing out on by not having a career? If so, I might never go back to work. I do wear many metaphorical hats and name tags: cook, janitor, book keeper, grounds keeper, laundry machine operator, psychologist and more. Salary.com has a Mom Salary Calculator. Based on my zip code, the number of kids I have, and that I stay at home with them, I should be earning something like $127,459. I could even print out a paycheck for myself from their site. That is more money (like twice as much) as I ever made back when I was a working stiff, so that made me feel really good. That figure is also about four times what our household actually brings in, underlining just how fantastical these numbers are. But when you are feeling overwhelmed and underappreciated, it is worth a few clicks to have a computer screen tell you what your work is worth. The massive fictional salary notwithstanding, I feel really lucky to not have a job right now. It takes a lot of work, though. It takes a lot of work to live and live well on one modest salary. It takes a lot of work to inoculate my kids against the consumer bug — the dreaded chant of “I want, I need, I want” products with Disney’s Olaf on everything from breakfast cereal to bed sheets to underpants. It takes a lot of work to be on food stamps, state health care and Women, Infants and Children, or WIC — the government-funded supplemental nutrition program. Then I need to resist the urge to be stigmatized by my subsidies. But if Walmart can get billions in federal subsidies, maybe it’s okay for me too (with a lot fewer zeroes). So, job or not, this Labor Day, I stand with working women — with Tracy and Raven and Adriana — who are fighting for the most basic right of all, the right to have a life and make a living. Labor Day is a good day to stop and remember all the amazing things that unions have done for the American workplace, it’s great to see the trend continuing with the Fight for $15 movement.